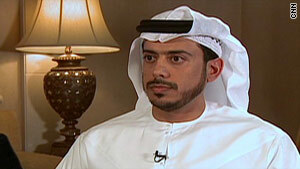 Chairman of the Abu Dhabi Tourism Authority, Sheikh Sultan Bin Tahnoon Al Nahyan. It's been a month since an explosion in the Gulf of Mexico led to one of the worst oil spills in U.S. history. This week the UAE announced that it is ready to offer advice and expertise to help plug the leak. MME takes an inside look at the advanced technology in place in Abu Dhabi to prevent and respond to spills in a region overflowing with oil. Over 90 percent of the UAE's crude reserves are based in Abu Dhabi and the revenues have built up the Emirate's cash reserves. Now, Abu Dhabi is keen to diversify away from oil with a push towards tourism. The sector was up 19 percent in the first quarter of this year alone. MME talks to the Chairman of the Abu Dhabi Tourism Authority, Sheikh Sultan Bin Tahnoon Al Nahyan and asks him where this growth is coming from.